Thanks to an improved economy, relative housing affordability and the uplift of professional sports via the Vegas Golden Knights and, coming soon, the Raiders, Las Vegas real estate is hot, hot, hot, according to Uri Vaknin, a partner at KRE Capital LLC, which acquired in 2013 a portfolio of more than 1,300 Las Vegas condominiums in partnership with Dune Real Estate Partners. According to Vaknin, the portfolio, which includes One Las Vegas on the south end of Las Vegas Boulevard and The Ogden and Juhl in downtown Las Vegas, the pace of sales at all properties is experiencing an unprecedented uptick with particular interest in the portfolio’s higher-end, luxury condos. Just last week, One Las Vegas closed on a 2,857-square-foot condominium priced at just under $1 million. The sale represented the most expensive sale to date for both the property and the portfolio. And, according to Vaknin, interest in the portfolio’s more luxurious, upgraded homes is not slowing. In fact, it’s peaking. He believes it is a direct reflection of the influx of California buyers and “right-sizers” looking for larger condos because of their value relative to housing prices in the Golden State, finish level and opportunity to enjoy a maintenance-free lifestyle with a Las Vegas address. 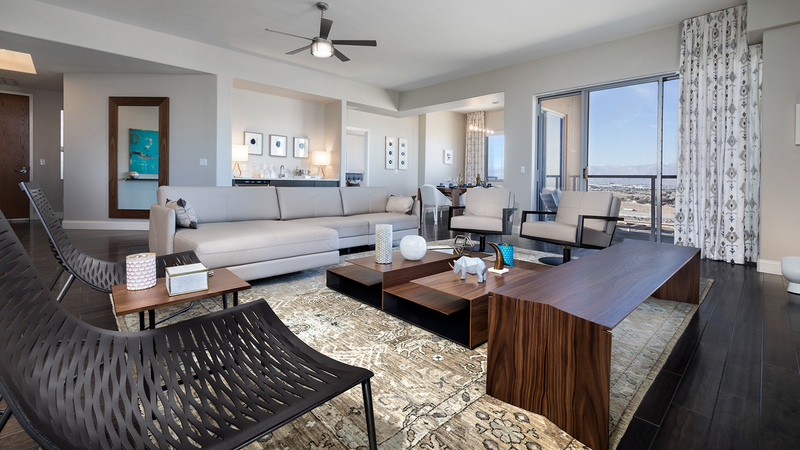 Vaknin is actively investing in making significant upgrades to several residences at One Las Vegas and The Ogden to meet the demand for luxury for this growing market segment seeking higher-end homes. Recently, several upgraded condos sold immediately upon completion of their makeovers at both communities. So Vaknin and his team are responding with a purposeful focus on upgrading select homes with more luxurious finishes and detail. The reasons for the portfolio’s success vary by property, but sales at all communities are uplifted by the universal appeal of Las Vegas, new energy and vibrancy created by professional sports, home prices that are still affordable, and in the case of the DK Las Vegas portfolio, the availability of expanded financing options. Since the Raiders’ relocation to Las Vegas was first announced in early 2017, Vaknin’s trio of communities have written nearly 230 contracts at its communities across its Las Vegas portfolio, including One Las Vegas, Juhl and The Ogden. In fact, One Las Vegas on the south end of Las Vegas Boulevard is just a few miles from T-Mobile Arena, home of the Vegas Golden Knights, the wildly successful and history-making first-year NHL expansion team. Vaknin also credits the “Raiders effect” in large part for the community’s success, citing several instances where buyers made the decision to buy based on the arrival of an NFL team to the city. And, while prices are clearly on the rise in Southern Nevada because of high employment and shrinking inventory, backed up by a recent report from Standard &Poor’s CoreLogic Case-Shiller national home price index, Las Vegas is still catching up to many other metropolitan areas that recovered more quickly from the economic downturn, Vaknin said. The Ogden offers several options, including Federal Housing Administration, Fannie Mae and Veterans Affairs programs. The Ogden, and now, One Las Vegas, are the only condominium towers in Las Vegas since 2008 to obtain Fannie Mae PERS (Project Eligibility Review Service) project approval, offering financing options not generally available in other condominium communities, Vaknin said. That means qualified buyers can purchase with as little as 3 percent down for first-time buyers, 5 percent for primary homes and 10 percent down for secondary homes.